Your browser does not support inline frames or is currently configured not to display inline frames. Scottish company Ambicare Health has launched the Ambulight PDT, a light-emitting skin plaster for the treatment of non-melanoma skin cancer using 'photodynamic therapy' (PDT). Ambulight PDT is the world’s first skin cancer treatment using a small disposable light-emitting sticking plaster worn by the patient. It is used in conjunction with a pharmaceutical cream that is applied to the skin. This creates a photosensitive compound in about three hours, then the special light source is shone on the area to activate the drug that destroys the skin cancer cells. Ambulight PDT enables patients to continue with their normal daily routine when undergoing PDT treatment. Pilot clinical trials have also indicated this treatment method has lower pain than conventional techniques whilst still obtaining an equivalent outcome. Ambicare says PDT treatment avoids the scarring associated with surgical removal of a tumour and the need for an inpatient hospital stay. However, conventional PDT treatment still requires the use of external light sources and often a hospital visit. Conventional PDT light sources are expensive and cumbersome. Consequently the use of PDT has largely been limited to hospital outpatient services where costs can be high and the service inconvenient for the patient. 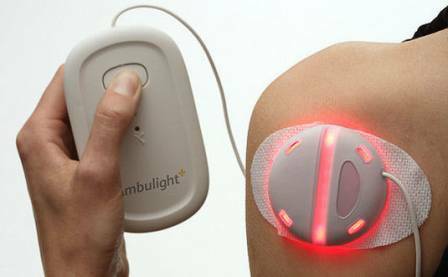 The Ambulight PDT light source is taped to the patient's skin and is small enough to allow movement whilst undergoing PDT treatment. Once the Ambulight PDT device is attached to the patient and activated, no further input from medical personnel is required. The treatment has been used in a pilot clinical trial at Ninewells Hospital in Dundee and gained EU approval last year. Ian Muirhead, CEO of Ambicare Health said, “The Ambulight PDT is the most advanced ambulatory PDT device to treat non-melanoma skin cancer to be developed to date. We believe that it is the future for this kind of treatment; Ambulight PDT will reduce costs for the healthcare provider by freeing up hospital day patient beds or cubicles and improve patient care by allowing them to continue with their normal daily lives during treatment."